The West African outbreak of Ebola has claimed more than 4,800 lives and this number is sure to rise. There is understandably a lot of fear about Ebola, but how does it actually compare with other fast-spreading infectious diseases? Plagues have been reported since biblical times, but it is difficult to know how serious these early epidemics were, or even what the infectious agent was. We now know that plague is a serious disease caused by the bacteria Yersinia pestis. The Black Death is thought to have been bubonic plague, named after the presence of infected lymph nodes; it killed one-third of the population of Europe in the 14th century. Bubonic plague killed one-quarter of the population of London in 1563, and the Great Plague of London killed 100,000 a century later. Plague is spread by fleas that usually infest rodents. The disease is still found in parts of Asia, Africa and the Americas. Few humans are now infected, although outbreaks occasionally occur. The extensive wildlife reservoir means that it will never go away. 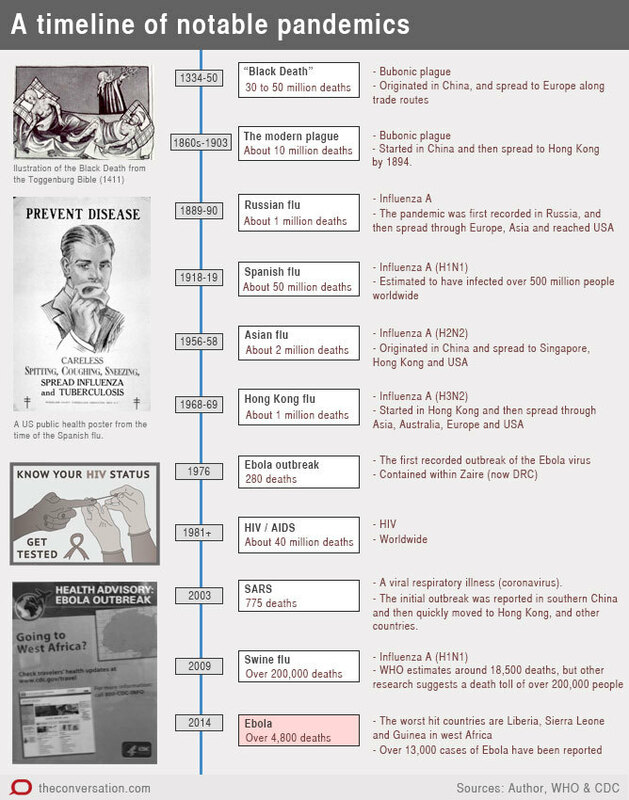 The 1914-18 war resulted in between 15 and 18 million deaths, but the 1918 flu pandemic killed more than twice that number. Influenza spreads rapidly by coughs and sneezes which release small droplets. These droplets may infect others while airborne or by contaminating surfaces. Symptoms of the flu can start within a day or two of being infected and last for about a week. But virus shedding begins before the symptoms and one-third of cases show no symptoms at all. The virus also readily mutates, so past infection does not necessarily provide future protection. The fatality ratio of seasonal influenza is low, usually claiming one in 1,000 lives, so it is often regarded as inconsequential. But a virus shift can cause a pandemic and increased rates of death. Of greater concern is the avian influenza reservoir in parts of Asia. 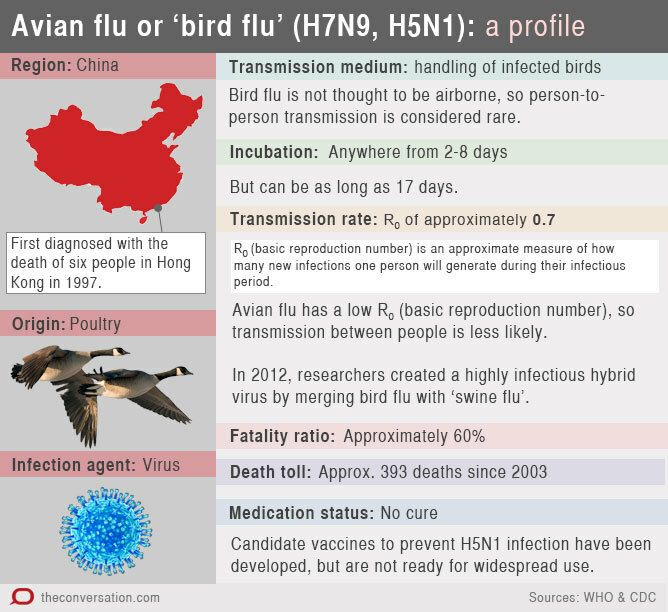 Transmission of H5N1 and H7N9 influenza A from birds to humans has resulted in a fatality ratio of 50%. If these viruses were to mutate and become easily transmitted between humans, public health services would be severely challenged by the resulting pandemic. The basic reproduction number of an infection, usually expressed as R0, is defined as the expected number of cases that would arise from a typical primary case in a susceptible population. If R0 is bigger than one, then the number of cases will increase until limited by control measures, behaviour change or the exhaustion of the supply of susceptibles. 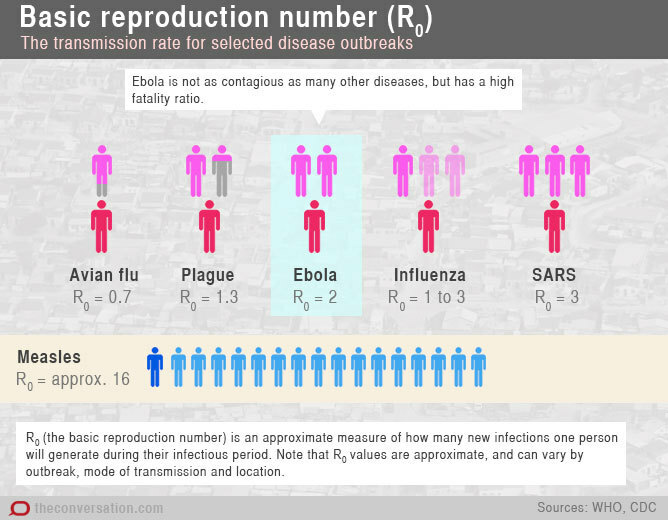 If R0 is less than one, then the incidence of infection will decrease and the outbreak will fizzle. 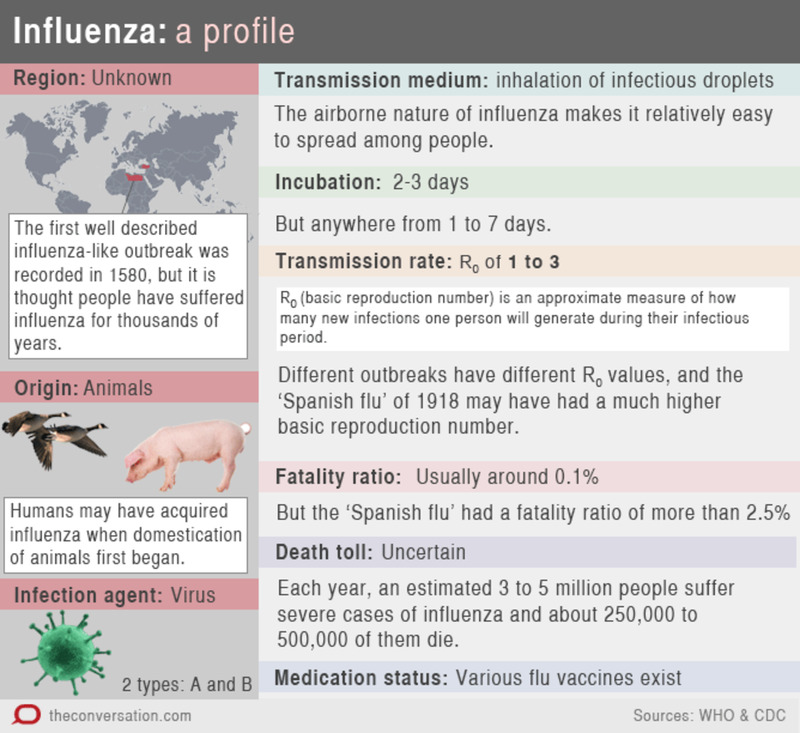 Influenza typically has values of R0 between one and three, so vaccinating 67% of the population would prevent epidemics. 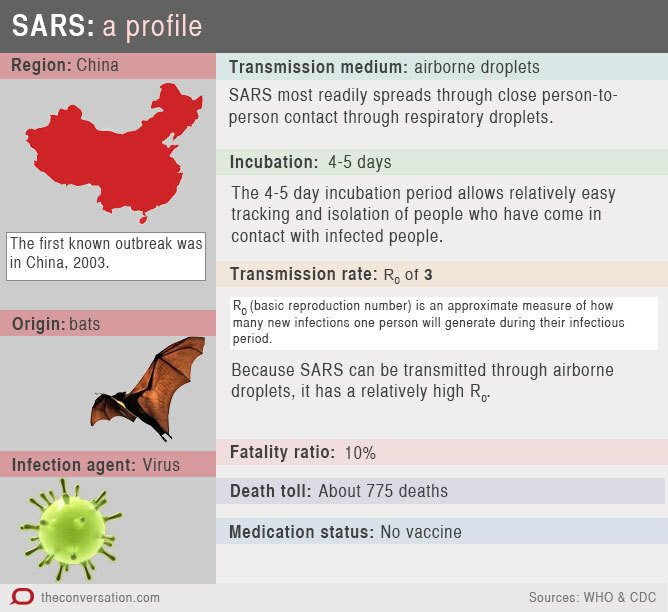 Severe acute respiratory syndrome (SARS) is likely to have emerged from a bat reservoir in China, and spread to a number of other countries in 2003. Its infectious agent is a coronavirus, from a family often implicated in the common cold. Its mode of transmission was similar to that of influenza but its basic reproduction number, at over three, was twice that of the flu. With no vaccine available and a fatality ratio around 10%, SARS presented a scary prospect: it caused an estimated US$40 billion of economic damage and severely disrupted international travel. But SARS had an Achilles heel. The long (four to five-day) incubation period made it amenable to contact tracing, enabling the isolation of contacts before they became infectious. It was largely these non-clinical interventions that succeeded in reducing the contact rate, and therefore the reproduction number, below one. The pandemic was brought to a halt and the infection eliminated, with the loss of 774 lives. However, another coronavirus is now responsible for 837 cases of Middle East respiratory syndrome (MERS) and 291 deaths. Ebola is not an airborne infection; it is spread by bodily fluids, which means that more intimate contact is required for transmission. The basic reproduction number is usually estimated to be around two, although a recent estimate for hospital settings in Africa puts the value of R0 over four. Research suggests around 70% of those infected in the latest Ebola outbreak will die of the disease. However, according to the World Health Organization, past fatality ratios have ranged from 25% to 90%. It seems that transmission only occurs while the patient is symptomatic, so contact rates must be low even though the probability of transmission given contact is high. The eight to ten-day average incubation period also suggests that contact tracing and isolation should be successful in halting the spread of infection. While not a fast spreader, another infectious disease that originated in Africa and is transmitted by bodily fluids is HIV/AIDS (human immunodeficiency virus infection and acquired immune deficiency syndrome). 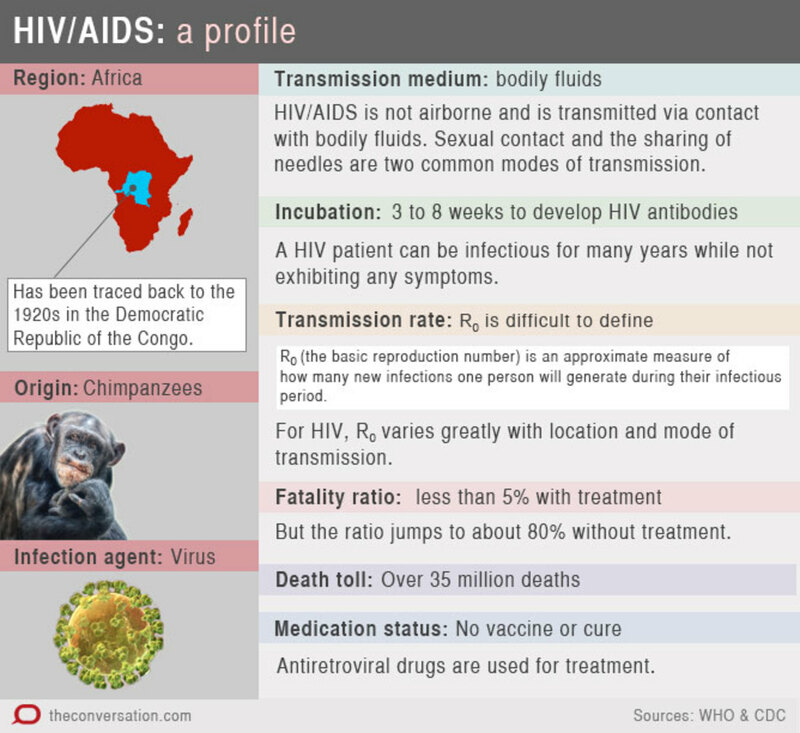 HIV was transmitted to humans in the 1920s from a chimpanzee, but remained largely confined to (what is now) the Democratic Republic of Congo until undergoing an epidemiological transition in the 1960s. The resulting global HIV pandemic has infected nearly 75 million people. 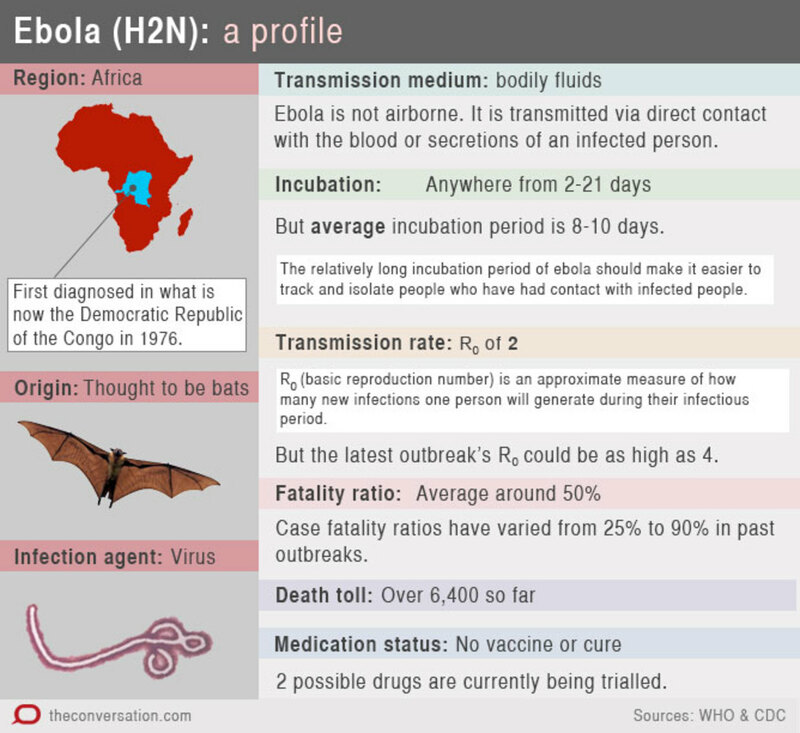 While transmission of HIV and Ebola both rely on the transfer of bodily fluids, there are major differences. A HIV patient can be infectious for many years while not exhibiting any symptoms, and may be unaware of their status. In contrast, for Ebola, the time from being infected to infecting others is measured in days and, although not as infectious as influenza, it is more readily transmitted than HIV. 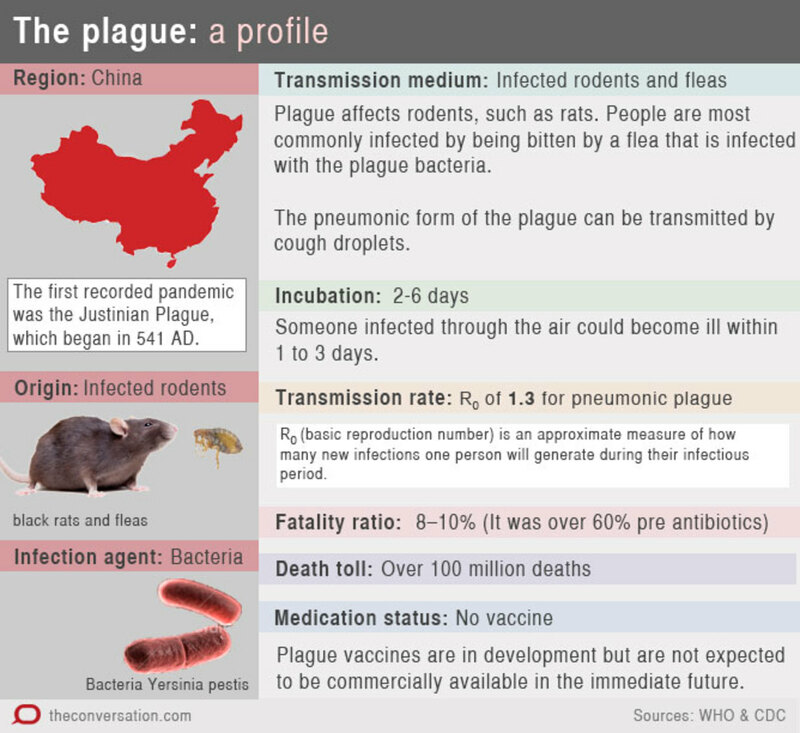 While bubonic plague is bacterial, all of the other infections mentioned above are viral. Yellow fever was the first human virus to be discovered in 1901. Since then more than 200 have been recognised. Most “new” infections result in “species jumps”, mainly from mammals and birds. The ability of viruses to adapt should make us wary of the avian influenza viruses and their potential for human-to-human transmission. Ebola has all the epidemiological characteristics of a containable infection, but it is only now spreading to developed countries that have no experience of dealing with it. The desirable strategy, from global health and humanitarian perspectives, is to eliminate the epidemic at its source. Mick Roberts receives funding from the Marsden Fund and the Health Research Council.